LARSSON™ centrisieves GL1050, GL850, GL600 are well-known and highly appreciated. These sieves are installed in over 50 countries. The first prototype was designed in the 1950s and the design and materials have continually been developed to keep pace with modern process requirements. Today, even the transmission housing is fabricated of stainless steel. LARSSON™ centriseves have many different applications, for example starch extraction from rasped potatoes and tapioca, de-watering of pulp, and fine fibre sieving. LARSSON™ censtrisieves are also frequently used in the fruit juice industry. 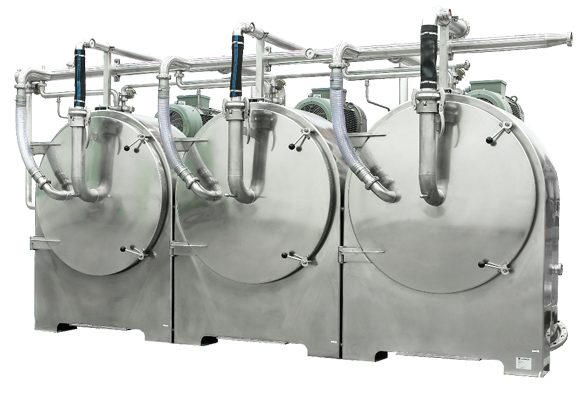 Centrifugal sieves are often integrated in a system, for example a starch extraction system. LARSSON integrated centrifugal sieves with special designed pumps and auto matic control equipment, to assure optimal process results. Our sieve cones are designed for two different types of sieving operations: with perforated plate for coarse sieving and wire gauze for fine sieving.